Ordering the food online is one of the easiest and fastest means for the people who love comfort eating. At times, people do not feel like preparing food at home and wish to get the food delivered at their doorstep, online food website is the best option to help you with. Again, this is like a wish come true for the people who are very busy in their work schedule, do not get time to cook food or go to a restaurant. Placing an order is no more a hassle for the people these days; you can go online either through your computer, laptop or smartphone and search for the best restaurants providing services in your location. You can place your order for your favourite food junction or you can explore some more restaurants in your area. 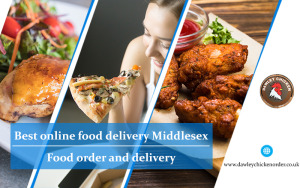 If you are looking for a food order and delivery in Middlesex, please contact Dawley Chicken Order. At Dawley Chicken Order, we serve burger meals, Burger, Peri Peri meals, starters, Dawley pizza and other family meals. We are a reliable online food restaurant with quality foods that are really delicious. Visit our website for more details.